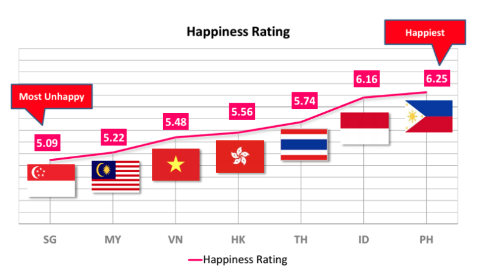 Singapore recently emerged at the bottom of a survey on the happiness of workforces around the region, with client-side staff saying they are less satisfied than agency executives. Jacqui Barratt suggests argues that poor management is mostly to blame. The happiness factor crops up every year in various surveys, and very rarely does Singapore ever get painted in a good light. The usual suspects are typically to blame for our unhappiness at work – a lack of training, career development and poor leadership – but there’s also a dash of dissatisfaction with salary thrown in there for good measure. When looking at our industry, the age-old happiness question is often around agencies versus client-side. In our experience recruiting talent in this sector, it’s not necessarily about pinning the two against each other, but the underlying issues across the whole industry. There are some pretty big disconnects between what is expected by talent, and what companies actually provide. This can be about things like money (always a favourite) or things like flexible working, which we know has become a huge factor in job satisfaction. In fact, our own Market Pulse data from last year found that 65% of employers surveyed in Singapore said they offer flexible working hours, but only 33% of candidates said they actually receive them. With regards to career development, 70% of candidates said it was the second-most important factor when looking for a new role, but only 34% said the company or agency they work at provides any kind of training plan for them. It has been made fairly clear to us that not enough organisations are investing in people’s success, or listening to what talent wants. Poor (or no) inductions and support leads to all parties being disappointed. While the ‘sink or swim’ approach might be popular with some leaders, it simply negatively impacts your employer brand and ultimately puts you back at square one. However, I do also feel there is a need to highlight individual responsibility for happiness. There are certain things talent should expect from their employers, but other aspects that they really need to take into their own hands. If a candidate bases their happiness levels around things like office location, and their unhappiness around management and leadership, then the onus is on them to better evaluate a company before joining the staff. For example, finding out how far the office is from your house is something that can be done during the interview stage, as are things like digging deeper about staff turnover and training and development to make a fully-formed decision. The issue of leadership is also a big one in Singapore, and I firmly believe both agencies and client-side need to conduct a big audit on how they promote their managers. Too often people are being promoted for the wrong reasons. You can be the best person at your job, but managing others to do that same job requires a whole different set of skills and competencies. What support and training are you giving to managers to step up? What mentoring and coaching is provided? A bad manager has a much bigger impact on morale and performance than one bad staff member who is not in a management role. We often see people (right or wrongly) being promoted, who then suddenly disappear because they weren’t up to scratch. The talent feels downtrodden for ‘failing’ in their first leadership role, while the employer rolls their eyes and dives back into their talent pipeline to try again. But with zero support and a weight of expectations, can we really expect it to go any other way? The key to managing all of this is feedback and communication. No news is not good news, and managers need to focus on providing regular communication to staff, while talent need to open up about what they want and expect from employers. Feedback leads to development, which helps people to improve, and the positive cycle continues.